As a practice I am trying to name the chords in each bar in Bach’s Prelude in C major. Can you correct me if I am wrong? where the jump between each note is a third. This spells a Dm7 chord. Finally, note that the C is in the bass so you should probably write this as Dm7/C. Also, if there are no accidentals (&sharp; or &flat;) then the chord must be diatonic to the key you are in. In C major there is no A (major) chord, but only an Am. Hence you are wrong in the fifth bar. However, as been pointed out, you have several errors, so it is best to go through everything. try to finish your task by studying lessons 40-44 in of this site, that I've just found right here as advertisement on the right of your question. Not the answer you're looking for? Browse other questions tagged theory chords chord-progressions or ask your own question. 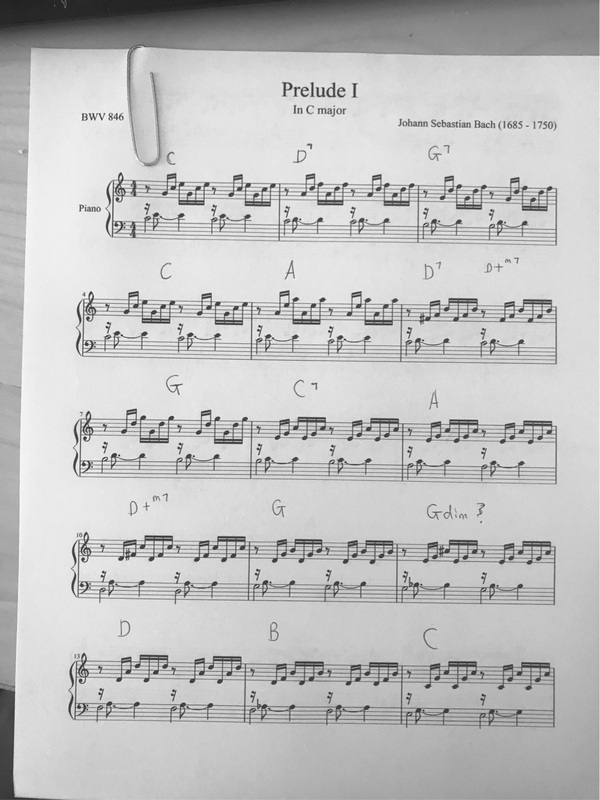 How many and what are the chords in a single key including relative harmonic and melodic minor? In Bach's Prelude in A Minor, what chord is B D G# and what's its function? Is there any system of naming chords that uses the chromatic scale?